ADW Modula-2, the successor of Stony Brook Modula-2, has been released as freeware. Most interestingly, ADW Modula-2 allows development of both 32- and 64-bits programs on the Windows platform. You can download the installation package from the ADW Modula-2 page. 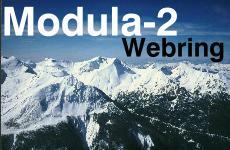 For more Modula-2 news, visit the Free Modula-2 pages. A tutorial for novice Modula-2 programmers. Includes downloadable source code (suitable for both XDS Modula-2 and Stony Brook Modula-2). This tutorial will get you started developing with the Win32 API as quickly and clearly as possible. Complementary to the tutorial, the Language Reference section contains a technical description of the Modula-2 language. Some projects including complete source code which you can download.